Metson is our only runner on Friday as he races under lights at Cranbourne this evening. Metson runs in race five, the Travis Harrison Cup over 1300m with Jack Martin to ride and jumping from barrier nine after scratchings. Metson ran well for second over 1300m on a heavy track at Cranbourne last start and provided the weather remains fair will have better conditions tonight. “The track tonight will be a lot better than what he encountered last time,” Moroney said. “In saying that, he got through the heavy alright and ran well. 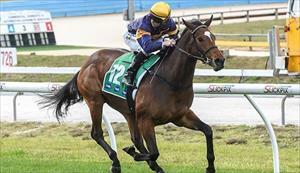 Metson worked well on Tuesday and has taken good improvement from his last start. “He’s trained on very well and is fitter for his race tonight,” Moroney said. “I’m not too concerned about the barrier - he’s the sort of horse who can make his own luck and if he springs the gates then he should be able to get across and settle just behind the lead which would be ideal. “It looks an even sort of race but if our horse turns up at his best then I do think he’s a winning chance."